Marc Benioff Wins the 8th Annual Crunchies CEO of The Year Award! After a whirlwind 2014, Salesforce founder and CEO Marc Benioff took home the Crunchie award for CEO of the Year. Benioff led Salesforce to an incredible year of growth, putting up Q3 revenue numbers 29 percent higher than the previous year. Earlier in 2014 Salesforce also picked up the lease for the upcoming Salesforce Tower, a 714,000 square foot skyscraper that will be the tallest building in San Francisco upon completion. Benioff accepted the award on stage and used the opportunity to reiterate his commitment to personal giving and spreading the 1-1-1 model to companies all over the world — committing 1 percent of time, 1 percent of product and 1 percent of equity. Companies such as Google, Yelp and Dropbox have also adopted the 1-1-1 model of corporate philanthropy. In 2014, some of Salesforce’s philanthropic efforts include a $ 5 million donation and 5,000 employee hours to San Francisco Unified School District, a $ 1 million gift to Code.org, and a #DFGives campaign at Dreamforce that raised 3 million meals for those in need. Since its founding, Salesforce has donated $ 73M in grants, 743,000 hours of employee time and 23,000 nonprofits run on Salesforce for free or with steeply discounted costs. “We have a great opportunity to give back, we have an awesome industry, we’re doing a great job, but we can also make this whole world a lot better,” Benioff said. In its 8th annual year of the Crunchies, TechCrunch awarded several industry leaders for awards such as best mobile application, best new startup, and CEO of the year. Benioff edged out runner-up Marissa Mayer (Yahoo) and additional nominees Tim Cook (Apple), Drew Houston (Dropbox), Travis Kalanick (Uber). It seemed fitting that the award was presented in the city where it all began — at Davies Symphony Hall in San Francisco. Is Your Leadership Style Right for the Digital Age? After a whirlwind 2014, Salesforce founder and CEO Marc Benioff took home the Crunchie award for CEO of the Year. Benioff led Salesforce to an incredible year of growth, the most recent quarter putting up revenues 29 percent higher than the previous year. Earlier in 2014 Salesforce also picked up the lease for the upcoming Salesforce Tower, a 714,000 square foot skyscraper that will be the tallest building in San Francisco upon completion. Before the holiday season is a distant memory, let’s review what happened in email inboxes in January and how it aligned with the predictions in our 2014 Email Marketing Holiday Calendar. Let’s also look back at the entire holiday season. During January, we predicted that major retailers would send their active subscribers around 19 promotional emails each. Our prediction turned out to be a little low. On average, retailers sent their active subscribers 19.7 emails each. As anticipated, holiday messaging fell off quickly after the start of the New Year. Much of the holiday messaging in January involved gift card redemptions, holiday décor storage, holiday clearance sales, and upsells around accessories for popular holiday gifts. For the July-to-January period, we predicted that major retailers would send each of their active subscribers 142 emails. The actual number sent was 142.3. Not too shabby predicting on our part. Self-congratulations aside, what this means is that holiday email sending volumes behaved pretty predictably over the past 7 months because our prediction model didn’t include any dramatic deviations from previous sending patterns. So while there were lots of arguments about whether retailers were more promotional earlier—and there definitely was stronger promotional content in mid-November—that didn’t translate into significant email volume changes. For a look back at all of our holiday advice and predictions, check out the 2014 Email Marketing Holiday Calendar. And keep an eye out for our 2015 calendar in June. 365 Retail Markets was founded in 2008 with the ambitious goal of revolutionizing the vending industry. In the 7 years since, the company has proceeded to do just that with innovative solutions and an eye towards the future. As Director of Product at 365 Retail Markets, Ryan McWhirter is responsible for maintaining this tremendous pace of innovation, iteration, and growth. In this latest “Small Business Spotlight” interview, he shares the importance of prioritizing what matters most and always moving forward. 1. What made you decide to start/make the jump to your company today? 365 Retail Markets built an organic image of innovation and excitement, and that drew me to meet with their two principals at the time. After confirming that the hype was real, I distinctly remember asking what their growth plans were, leaving a larger company at the time. “We are skipping medium and going straight to large” said Matt Caston, now our Chief Strategy Officer. The conviction and confidence of that statement was enough to make me jump onboard immediately, and most importantly that statement has held true, if not exceeded. 2. How do you balance the multiple hats that you are required to wear? My advice for anyone juggling multiple roles is to schedule time on your calendar to focus on each role every week. Depending on the roles, you may need more time for one than the other, but having that time to take stock of where things are on each plate is crucial. For non-critical requests, I let them stack up and don’t typically complete them until I have 3 things to do, letting me batch my work and focus on my main role the majority of the time. 3. What are the top three company priorities that you focus on? 365 Retail Markets is a pioneering SaaS company. Therefore, our mission and subsequent top priorities focus on making sure our products are scalable, secure and integrated. When I joined 365 Retail Markets in 2012, we had about 60 or so kiosks out in the field. We now have well over 3,200! Obviously we’ve put a lot of thought into scalability. On the security side, we’re proud to be one of the few in our industry who is PCI Certified, handling millions of credit card transactions a month. Lastly, we realize our products are part of a larger ecosystem, thus we’ve led the way in creating industry standard API s that interconnect our products to the rest of the industry. 4. How do you prioritize initiatives? Walk us through how you determine where you invest time, people, and dollars. When you’ve grown as fast as we have, you quickly begin to receive requests from every side to suit specific needs. These can range from minor enhancements all the way to wholly new products. To ensure we are delivering meaningful changes to the masses, we’ve continued to refine our idea funnel, and will be introducing more ways to collect customer feedback in 2015. Today, the majority of customer feedback originates from our focus group status calls (a collection of top customers), trade shows, and emails to our Innovation Team. We are also big admirers of the Salesforce Idea Exchange, and look forward to implementing a similar interactive community in the future. 5. Walk us through the characteristics that you look for when hiring top talent. We have an incredible team at 365 Retail Markets! When we look at bringing new team members on board, we look for those who have directly interacted with customers in the past, those who have worked on complex projects and those who mesh well with 365’s culture of innovation. 6. What are the keys to your company’s successful growth? Our company values are built around something we call iCASH (Innovation, Collaboration, Accountability, Service and Happiness). When you look at each of those words, each one represents a focus that led us to our successful growth. Through collaboration and accountability, we continue to deliver exceptional innovation and service which leads to happy customers. Our exponential growth underscores how real that happiness is, and our commitment to these values is central to every all-hands meeting within our organization. We even pass out mugs (one for each letter) every month to those team members who exhibit each value the best. 7. What is the one piece of advice that you want to share with executives of other small businesses? Regarding Salesforce specifically, most executives buy-in, login for the first time, look at the tabs across their home page, then draw a shortsighted conclusion about what Salesforce is as a product. What’s driven our growth is the realization that Salesforce is a platform, and not just a product. I’ve seen the AppExchange begin to tease that realization out of other Salesforce users over the past couple years, and every Dreamforce is becoming more and more robust with complimentary add-ons that make our investment in Salesforce much more valuable. As a customer company, we run our entire business in Salesforce, and can’t imagine how we would have skyrocketed to such heights without it! Download our free e-book to learn how Salesforce can help your business grow. In this blog post, Mark Hunter shares with us the dilemma with prospecting and how you can avoid the pitfalls with one simple phrase. So strap yourselves in and take note! The days of “one-call closing” are long gone, yet that is exactly what far too many salespeople are doing. They make one call, don’t get the response they want and move on to the next prospect. When building out your prospecting plan, determine the length of time and the number of messages it’s going to take to turn the prospect into a customer. Once you know this, you can then work backward to begin figuring out the number of contacts you should be making each week or each day. Using this approach, you’re able to close more sales and it is because of several key reasons. First and foremost, it allows you to use your time much more effectively, because it takes out all of the false starts that occur when someone embraces a “prospecting blitz.” Second, it immensely helps your attitude and level of motivation. When there are no results from prospecting, you can’t help but become demotivated. Executing a balanced plan helps to minimize the emotional lows. Third, it creates higher value customers. Let’s talk about the impact this strategy can have on creating higher value customers. Using this approach, you’re less likely to gain an economic-oriented customer, as these people are looking for price and are less responsive to longer term messaging. Conversely, the high-value customer – the one who sees real value in what you have to offer – is going to be far more attuned to your messaging that is creating confidence and competence. These customers also are seeing value in you and what you’re selling, thus creating still more value. “Don’t start what you can’t finish” works! It’s not an excuse as to why you shouldn’t make any prospecting calls today. No, it’s the reason why do need to make prospecting calls today and do it again tomorrow and every day thereafter. Mark Hunter, one of the sales world’s most prominent thought leaders, is a Salesforce Sales Community contributor. This community is a new collaborative networking group for sales executives sharing best practices and innovations in sales leadership. We encourage all salesforce customers to join Jason and other top sales thought leaders in the new Salesforce Sales Community. Mark Hunter, “The Sales Hunter,” is author of High-Profit Selling: Win the Sale Without Compromising on Price. He is a sales expert who speaks to thousands each year on how to increase their sales profitability. He was named one of the Top 50 Influencers in Sales by Top Sales World. To receive a free weekly sales tip and read his Sales Motivation Blog, visit www.TheSalesHunter.com. You can also follow him on Twitter, on Facebook and on LinkedIn. Want to accelerate your sales performance with 7 tips to success? Visit our website or download the free e-book. How did you first get started with and learn Salesforce? At the risk of dating myself, I started my Salesforce learning adventure a little over 6 years ago by signing up for a Developer Edition (which I still use to this day!) and going through the Force.com Fundamentals book. Many of you may have chosen to learn Salesforce with one of our popular workbooks like the Force.com Workbook. Or maybe you attended a Dreamforce session. However you started, at some point in your Force.com journey you probably asked yourself, “What should I learn next?” As the breadth and depth of the platform has expanded over the years, it can sometimes be challenging for Force.com newbies (and even veterans) to navigate all the nooks and crannies of the platform. 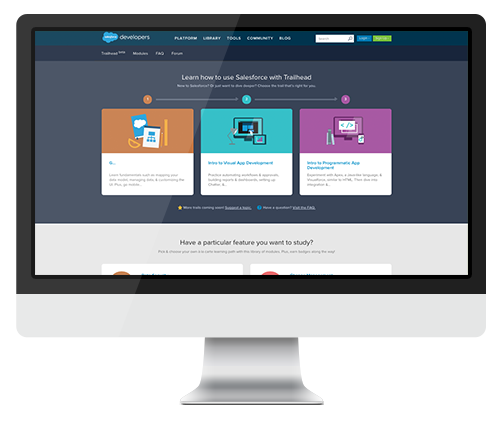 Enter (as of Dreamforce ’14) – Trailhead – a great new(ish) tool to learn and challenge yourself on the Salesforce1 Platform. If you haven’t heard about or tried Trailhead yet, drop everything and go check it out now. Even a cursory perusal of the site should hopefully make its intent and focus clear. Trailhead breaks down the Salesforce1 Platform into bite-sized, digestible pieces (aka ‘modules‘) and presents developers and admins with a guided learning path (aka ‘trails‘) for consuming those pieces. Which particular trail(s) you decide to hike on depends on your background (e.g. developer or administrator) and goals (e.g. ‘I want to develop apps without writing any code’). But chances are, whatever you’re looking for, we have a trail for you. And it’s all self-paced. Once you log into Trailhead, you can track your progress and pick up where you left off. So you can go on a Trailhead binge (à la watching the entire Breaking Bad series over a weekend), or go through the content at a more leisurely pace – whatever works for your schedule. Trailhead is also a great resource for anyone studying to take a Salesforce Certification exam. In addition to the guided learning trails, Trailhead has another feature that truly sets it apart from anything else out there (and we have Josh Birk to thank for that). After every unit, you’re presented with a challenge that you have to complete in a Developer Edition (DE). Once you complete the challenge in your DE, you’re presented with “a magical green button”. Press it and presto, you’ll either see a success pop-up or an error message with instantaneous and specific feedback for what you just did. Kinda like having your own Force.com personal trainer (without all the yelling)! And best of all, you earn points and badges as you complete the challenges (gamification, ftw!). You can even show off your points and badges to the world via your Salesforce Developers profile. We’ve been blown away by the community response to our beta so far, but we’re just getting started. We’re committed to making Trailhead even bigger and better. If you’re among the legion of developers and admins who’ve already drunk the Trailhead Kool-Aid, then you already know everything from above. So what do I have for you? Glad that you asked! This week we released a great set of new content and functionality. We released 2 new modules this week – Change Management and Data Security. Change Management addresses one of the most important (and often overlooked) aspects of developing on the Force.com platform – how to manage and deploy changes in your organization. This module is targeted at admins (as part of the Into to Visual App Development trail) and focuses on point-and-click tools for managing deployments (like change sets). Stay tuned for another module on this topic that will be targeted at developers and will cover other tools like the Eclipse IDE, Ant migration tool, etc. The Data Security module covers one of the more complicated topics on the platform – “who sees what”. It covers all the various levers (profiles, permissions sets, sharing rules, etc.) that control what data a particular user or set of users can view, edit or create. It’s a “need-to-know” topic for anyone working on the Force.com platform. When we first released Trailhead at Dreamforce ’14, some of the modules were “gimmes” – i.e. you could simply click “Mark as Read” and move on. Lets call a spade a spade. That’s lame. We’ve replaced all the “Mark as Read” units in the Apex Testing and Visualforce Basics modules so you can test your knowledge with hands-on code challenges. Best of all, if you had previously gone through Trailhead and marked these modules as read, you can retake the challenges and earn an extra 400 points in the process. In certain cases, there’s no way for us to test your knowledge via a hands-on challenge. Instead of ’Mark as Read’ gimmes, we’ve developed multiple-choice quizzes for those cases. To keep things a little interesting (and to make sure that you’re paying attention! ), we award points on a descending scale based on how many tries it takes you to get all the right answers (100 point on the first try, 75 on the next and so on). Make sure you read the questions carefully before hitting that “Check Challenge” button! So that’s what we just released. What’s on tap for the future you ask? The three trails that you currently see in Trailhead are just the start. Our top priority is to complete those three trails by releasing all the “Coming Soon” modules. Expect to see many more modules in the upcoming weeks and months. We’re also working on new trails for things like Lightning, Mobile SDK, Identity and more. We’re also doubling down on new Trailhead content for our #awesomeadmin community. Have suggestions for content? Share ideas here. Would you like to work through a tutorial (like one of our awesome DIY workshops from last year’s Dreamforce) and build an app from scratch on Trailhead? I thought you might. That’s an upcoming feature we’re calling “Projects” and we’re hard at work adding support for them in Trailhead. ‘Nuff said. There’s a whole set of goodies on the roadmap to make Trailhead more awesome. Unfortunately the Safe Harbor police just got wind of this blog post, so I’ll have to leave you in suspense for now. Rest assured though, you’re going to like it! The best ideas for everything we do always come from our awesome community. Trailhead is no different. 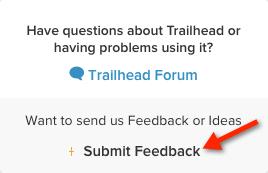 Help us make Trailhead better by sending us your ideas and feedback. Just click on the ‘Submit Feedback’ link. Hopefully this post has gotten you excited about trying Trailhead for yourself. Go earn those points and badges! Please also help us spread the word and make Trailhead a verb. So the next time someone asks you, “What is the best way to learn Salesforce?”, you’ll have the best answer, “Trailhead it”. If you’re looking for a quick way to add Salesforce Mobile SDK to your existing iOS native app, we’ve got good news. Starting with Mobile SDK 3.0–and with improvements in 3.1–you can now use CocoaPods to merge Mobile SDK modules into your apps. No more tedious downloading, copying, and reconfiguring. CocoaPods does it all for you. In Q1 2013, there were 374M mobile daily active users (DAU) on Facebook. By Q3 2014, there were 703M, an increase of 65%. Mobile monthly active users (MAU) increased by 50% in the same time. These mobile growth numbers far outpace the overall growth rate for Facebook, and the percentage of total daily active users who are on mobile has risen from 64% to 81%. Since Q3 2013, the number of mobile only monthly active users – people who don’t use Facebook on a desktop or laptop at all – has risen from 254M to 456M. In the United States, CPC costs for mobile ads have risen each of the last seven quarters, totaling an 80% increase to $ 0.28. In the US, CPC costs for mobile ads have risen each of the last seven quarters, totaling an 80% increase to $ 0.28. Social.com has seen even faster growth in mobile ad spend than Facebook’s mobile user growth. Our customers have increased their overall mobile ad spend by 239% when comparing the nine month period from January 2013 to September 2013 versus January 2014 to September 2014. The increase in demand for mobile advertising inventory has seen advertisers pay an increasing premium for their ads overall, both in CPC and CPM terms. Advertisers are increasingly looking at the premium range of targeting and creative options on Facebook to successfully optimize their media spend. In the United States, CPC costs for mobile ads have risen each of the last seven quarters, rising a total of 80% to $ 0.28. CPM costs have risen as well, however the CPM growth rate peaked in Q1 2014, and have somewhat stabilized in Q2 and Q3, at $ 4.50. Savvy advertisers in 2015 are refining their mobile strategies to take advantage of all of the robust targeting options Facebook has to offer and expand their reach to include both the Facebook mobile newsfeed as well as the Facebook Audience Network to reach their customers where they are spending their time. We look forward to an exciting year ahead for advertisers in 2015 and look forward to bringing you more insights from the social advertising world throughout the year including a detailed look back at the all important Q4 in advertising. The Social.com Advertising Benchmark report is here! Download the report at our website. Benioff led Salesforce to an incredible year of growth, the most recent quarter putting up revenues 29 percent higher than the previous year. Earlier in 2014 Salesforce also picked up the lease for the upcoming Salesforce Tower, a 714,000 square foot skyscraper that will be the tallest building in San Francisco upon completion. In 2014, some of Salesforce’s philanthropic efforts include a $ 5 million donation and 5,00 employee hours to San Francisco Unified School District, a $ 1 million gift to Code.org, and a #DFGives campaign at Dreamforce that raised 3 million meals for those in need.